Mt. Prospect, Ill., March 20, 2018 – Bosch premium carbide takes concrete drilling to the next level in Bosch SpeedXtreme™ SDS-max® Hammer Bits, the ideal solution for drilling in reinforced concrete thanks to a 100 percent full-head carbide tip. The bits offer 5x life in concrete and are optimized for maximum performance in larger heavy-duty rotary and combination hammers. Bosch SpeedXtreme bits are full-head carbide up to 1" diameter, double the size of competitive bits. And Bosch SpeedXtreme bits feature that full-head carbide tip in a four-cutter design, which offers 180-degree cutting diameter and 100 percent power transfer during drilling. In addition, four symmetrical 90-degree side angles create a wider and sharper tip versus competitive bits to aggressively cut through tough material like rebar. SpeedXtreme bits are manufactured with Bosch’s proprietary diffusion-bonding technology, which bonds carbide and steel at a molecular level. It’s a precise high-heat, high-pressure solid-state welding process that produces jobsite-proven bits. A four-flute design for SpeedXtreme bits makes drilling in concrete fast and precise. The four flutes aggressively pull dust away from the work, keeping the bit tip cooler for longer bit life. An active-centering tip is designed for quick, accurate starts and guides the bit through concrete, an important feature when setting anchors or fasteners. A wear mark on the bit helps users deliver the precision hole-diameter tolerance that concrete anchoring demands. 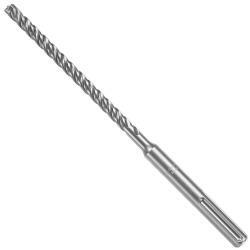 The full range of Bosch SpeedXtreme SDS-max Rotary Hammer Bits extends from 3/8” to 1" diameter. The bits will be available starting July 2018. To learn more about the Bosch SpeedXtreme SDS-max Rotary Hammer Bits or to find a local dealer, visit www.boschtools.com or call 877-BOSCH-99. Check out www.bethepro.com for additional tips and videos.